Work away! Work away! It’s time for group! I love group time in our toddler environment. It can help ground the children at the beginning of the day, become a learning platform for a new concept, and it can bring us together as a cohesive community. It doesn’t take long for children to come when we ring the bell and begin singing the “Work away” song. Then, we lay colored circle placemats down to help build spatial awareness. At the beginning of the year, when children are unfamiliar with routines and each other, the group is a way to get to know each other. (Ruby’s wearing a red shirt, red shirt, red shirt, Ruby’s wearing a red shirt all day long! Who is sitting next to Ruby?) We may begin group by singing a greeting song, “Hello Susie! So glad to see you! Hello, Austin! So glad to see you, too”. 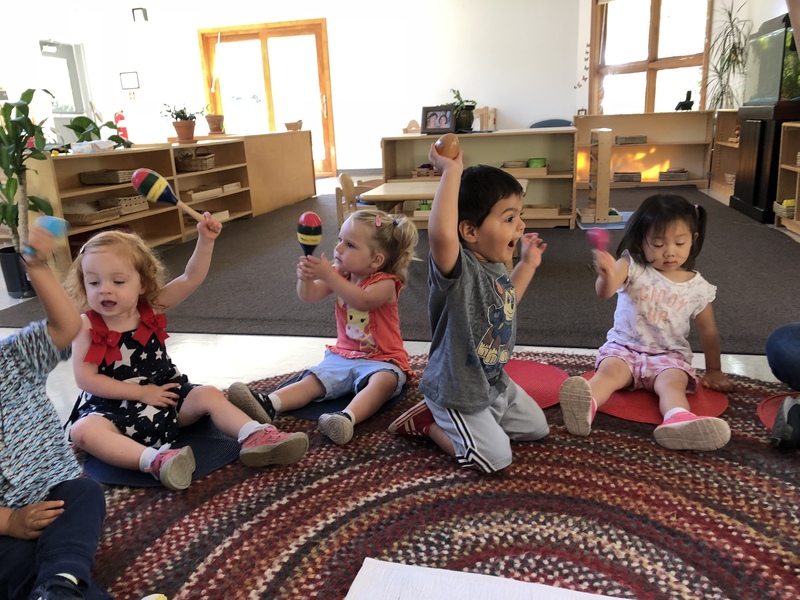 We may sing a finger play, “I have eight fingers and two thumbs, watch me play my thumb drum, thumb drum, thumb drum, can you play your thumb drum?” I like to incorporate music and movement together and an old favorite is, “Head, shoulders, knees and toes, knees and toes”. We can build on a familiar song by singing it in Spanish or singing really fast or really slow. We may read a story, taste an unusual food, or celebrate someone’s culture or birthday. 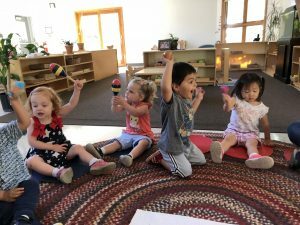 Group time helps build concentration and focus in a developmentally appropriate fun learning environment. We welcome you to join us any day of the week at 10:00 a.m. in room 102’s toddler class.